Beauty of African international pageant (BAIP) is a redefinition of beauty with brains and its here again with a new edition themed, Ambassador For Tourism, Peace And Friendship. Find below some of the many reasons why every beautiful and intelligent lady should contest for this epoch making pageant. Over the past Eleven years, Beauty of Africa International Pageant, formerly known as Face of Daniels, has been able to discover and promote high-ranking models that are currently enjoying corporate endorsements both within and outside the country. The pageant has also brought together the crème de la crème of corporate Nigeria, top government functionaries, media executives, entertainment giants, designers, and tourism and marketing executives among others. The Beauty of Africa International Pageant was formerly known as Face of Daniels International (FODI) Beauty Pageant. It metamorphosed to the Beauty of Africa International Pageant (BAIP) in 2010. The pageant was held for seven years in Port Harcourt, and for a year in Abuja (2015). Following the first Lagos edition in 2016. Over the years, the pageant has discovered and promoted winners to represent Nigeria in world beauty contests such as Miss Tourism International World finals, Miss Globe World finals, Miss Tourism Metropolitan World finals, Miss Tourism Queen of the Year World finals, and Miss Supranational World finals, which are currently enjoying corporate endorsements within and outside the continent. The Beauty of Africa International Pageant organized by Daniel Media Entertainment and Lanre Makun Events and it is proudly supported by; Federal Ministry of Information and culture, Soundcity TV, Audio Visual First, Studio 24, Soundcity radio, Music Africa, Planet TV, Spice TV, Plural Media, Provision Media, LASAA, Eloquent Event, Magic Moment Vodka, CTL Africa, First Media, On TV, Pemmakui, Style Squad, and Tommy Walson. 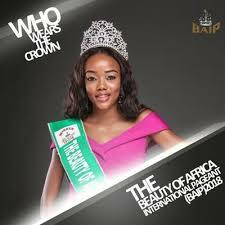 Endorsed by the World Beauty Association and Federal Ministry of Information & Culture, BAIP is also the franchise holder of Miss Tourism International Nigeria; Miss Supranational Nigeria; Miss Globe Nigeria; Miss Tourism Queen of the Year Nigeria; and The Look of the Year Nigeria. Need I say more? There are a whole lot of fascinating reasons why you should contest for this grand beauty pageant. So go on and spread the word to all the beautiful, and talented young lady out there. The Beauty of Africa… Promoting Tourism Peace and Friendship.